Help Aruku, a chief of the Hawk tribe, restore peace and lead her tribe to a better future in this real-time strategy and adventure game! On a beautiful chain of islands, life used to be peaceful until a comet fell from the sky. Now, tribes and creatures that once lived in harmony are fighting each other. Help reestablish balance by exploring the islands, gathering sacred Totems and returning them to their home – the Cradle of the North. To end the war once and for all, develop your villages, warriors and weapons by building huts, training grounds, archery ranges, scout lodges and barracks. 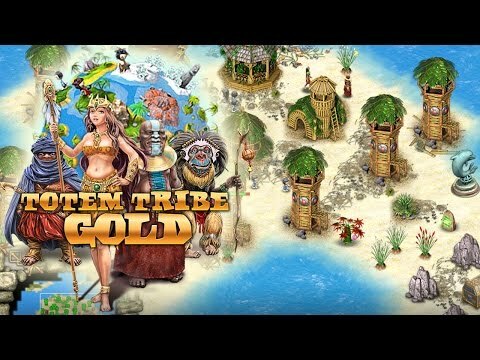 Bring prosperity back to this struggling planet by enhancing the Hawk tribe’s skills and equipment. Totem Tribe Gold © 2012 - 2019 Enkord. iPad Adaptation © 2012 - 2019 G5 Entertainment AB.